Vernon Volumes: Baby food is delicious!!! Connor passed his 6 month checkup and our doctor gave us the green light for baby food! I'm certain Connor's sick of eating formula mixed with cereal, and now he's finally got variety. 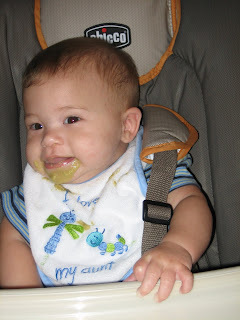 We've started him on green beans and bananas so far and he gobbles it up. He'll open his mouth wide and kick his feet as the spoon comes towards him. A big difference from the first few feedings when he's scowl at us and we had to push the disgusting cereal between his pursed lips. His measurements are pretty average... Ok, actually they're perfectly average. I think he's an above average baby, but our doctor thinks otherwise. Yuuuuummmmm! That looked DELICIOUS!!! And Connor seemed to really like it. Must be a good cook in the house.